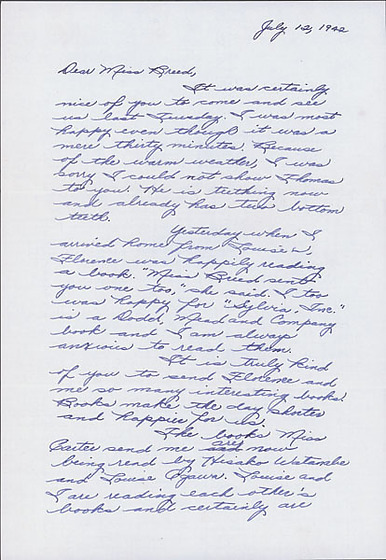 1 letter and envelope from Margaret Ishino to Clara Breed. 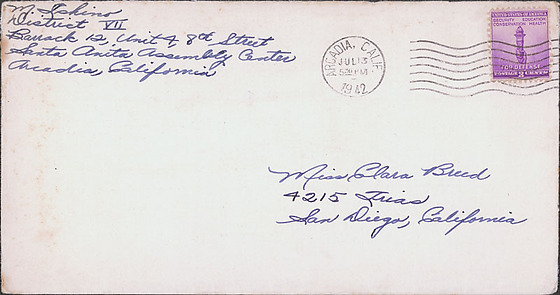 July 12, 1942/Dear Miss Breed,It was certainly nice of you to come and see us last Tuesday. I was most happy even though it was a mere thirty minutes. Because of the warm weather I was sorry I could not show Thomas to you. He is teething now and already has two bottom teeth./Yesterday when I arrived home from Louise's, Florence was happily reading a book. "Miss Breed sent you one too," she said. I too was happy for "Sylvia, Inc." is a Dodd, Mead and Company book and I am always anxious to read them. /It is truly kind of you to send Florence and me so many interesting books. Books make the day shorter and happier for us. /The books Miss Carter send me are now being read by Hisako Watanabe and Louise Ogawa. Louise and I are reading each other's books and certainly are enjoying them. /Florence has learned her alphabet and at present is learning how to write. It will not be long before she will write her name./Please write and tell me about your Vacation Club at the Children's Department for I will be interested. /We thank you from the bottom of our hearts. 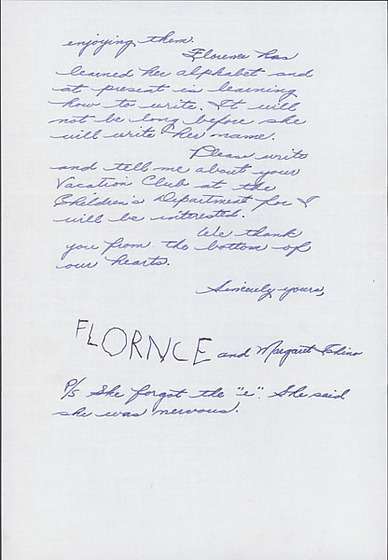 /Sincerely yours,/FLORNCE and Margaret Ishino/P/S She forgot the "e." She said she was nervous.